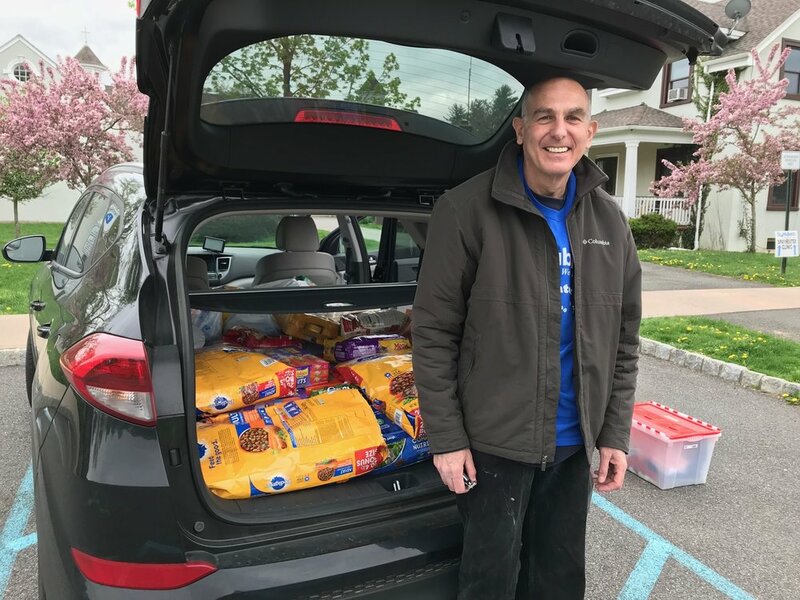 When Tom Cresong signed up his Catahoula mix puppy Luna for puppy kindergarten at St. Hubert’s he had no idea that he would soon become an indispensable volunteer. But as Luna graduated into more advanced training classes and Tom saw how much was going on at the shelter, he decided he wanted to get more involved. After about a month working hard alongside staff cleaning kennels, Tom volunteered to help with St. Hubert’s new Field Trip program. Through this program, members of the public can drop by the shelter any day of the week, fill out a questionnaire designed to gauge their comfort level with different size/strength dogs, and take out a suitable one for an outing. Field trips can last an hour, an afternoon or the whole day, and have proved to be a valuable way to get people into the shelter, gather more information about adoptable dogs, and allow St. Hubert’s to more effectively “market” them with compelling photos and videos. It’s also led to a number of adoptions. 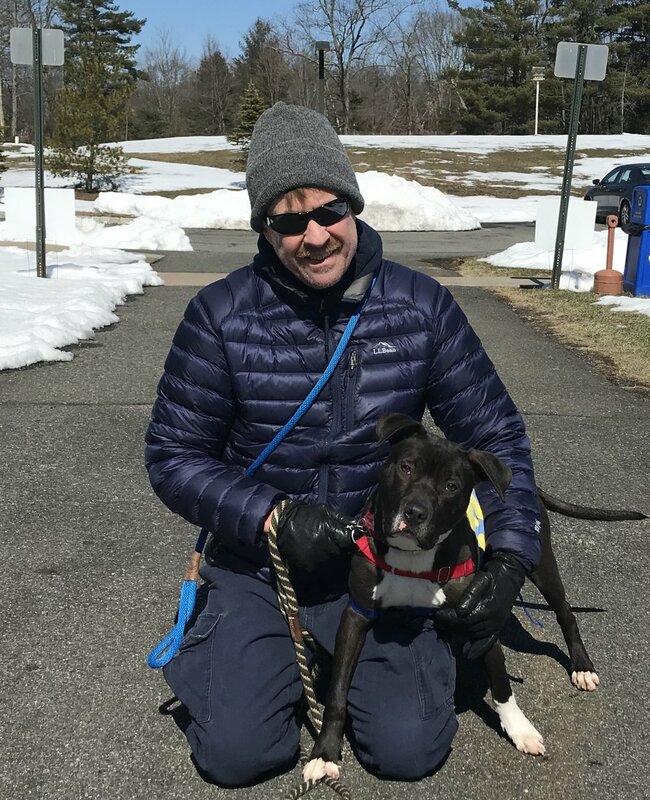 Since November Tom has served as Field Trip Coordinator on Sundays, handling paperwork, matching up participants with dogs and preparing them for their outing by “dressing” them in a harness, collar and Adopt Me vest. Sundays can be very hectic and dogs can be exuberant, but Tom is always calm and smiling, a welcoming presence in the front lobby. He has facilitated many of the more than 300 field trips logged so far. We are very grateful for Tom’s help, and to his dog Luna for bringing him to St. Hubert’s! 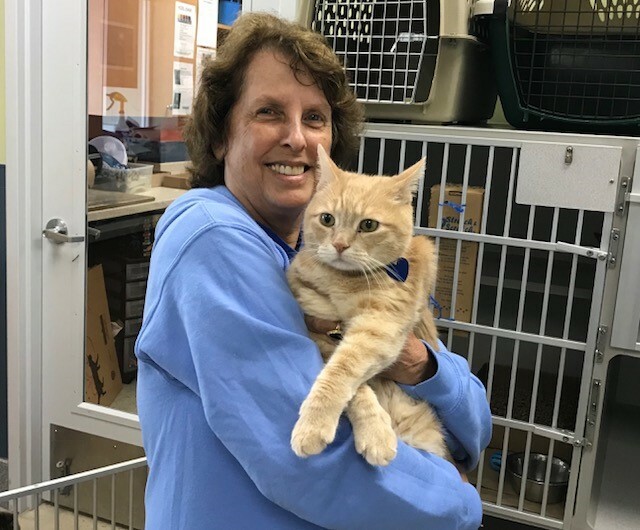 When Tara Myers moved back to NJ from Illinois, finding an animal shelter where she could volunteer was high on her to-do list. Tara had been volunteering at shelters for many years, and even with a growing family to care for she was determined to continue helping out. 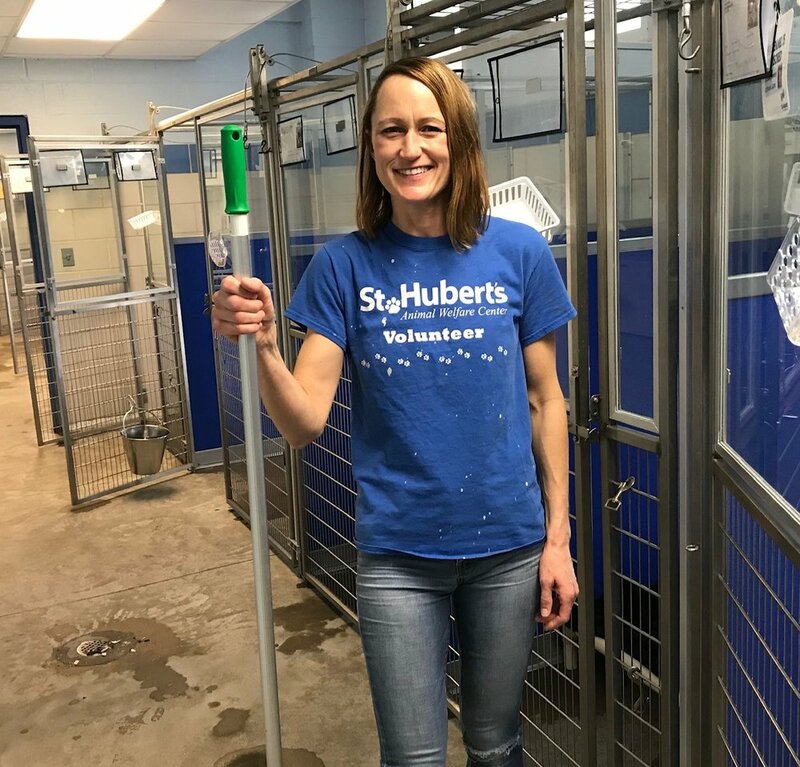 That was three years ago, and since then Tara has been a dedicated volunteer at St. Hubert’s; you can find her almost every Sunday morning cleaning in the kennels. It’s not easy work, but Tara puts on her rubber boots and gets the job done quietly and efficiently. She has devoted more than 400 hours to keeping the dogs comfortable and healthy. She cleaned until she was seven months pregnant with her second child, and resumed her Sunday morning shift not long after his birth. She is, not surprisingly, a favorite of the kennel staff. Tara often stops by the shelter with her 5 year old daughter, who loves the cats. And it makes her happy to check out who’s been adopted since her last visit. This busy wife, mother and dog owner (a 50 lb. mix named Tallulah) likes “being part of something big,” and is glad she found St. Hubert’s. We are glad she did too. Shortly after retiring from a career in consulting back in 2015, Lynn Seguin filled out an online volunteer interest survey she’d seen on the State of NJ website. 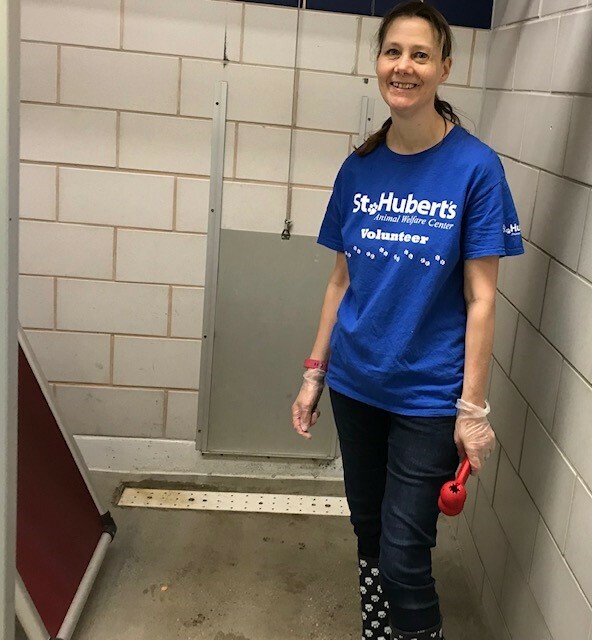 She’d been thinking about what to do next, so when she was contacted by St. Hubert’s volunteer coordinator in response to the survey Lynn decided to give helping out at the shelter a try. An experienced foster already when she began volunteering for St. Hubert’s, Glynis quickly became indispensable. Not all fosters are able or willing to handle the demands of momma dogs and puppies, but Glynis told St. Hubert’s foster coordinator, Kat Thorpe, at the outset, “Do not hesitate to call me.” Kat, who gets requests almost daily from overwhelmed partner shelters in the south to take pregnant and nursing dogs, took Glynis at her word. Glynis has fostered litters of 5, 8, 10 puppies. She’s cared for a tiny one struggling with giardia and kennel cough, kept her hydrated, nourished and swaddled her round-the-clock and didn't leave her side until she was on the mend. (“Glynis literally saved her life,” says Kat.) She has sat with a dog through a long labor; the mom finally began delivering with her head in Glynis’ lap. Glynis has slept in the room with newborn puppies, sometimes waking up to a small nose nuzzling her. Warm and gregarious, this mother of five grown children has always relished the caregiver role. Glynis grew up with horses, goats, cats and dogs, and she and her husband, Peter, currently have two rescue dogs, a black lab mix and a Border collie mix. Fostering is a family affair for the Burgdorffs. Glynis and Peter have a room dedicated to their foster pups, and baby monitors are placed strategically around the house. Peter takes the morning shift, letting Glynis catch up on sleep and gear up for afternoon and night duties. Her kids will pitch in when they’re around, and her two young grandchildren are, not surprisingly, always excited to come over. “A house filled with puppies encourages your children to come home to visit!” says Glynis. 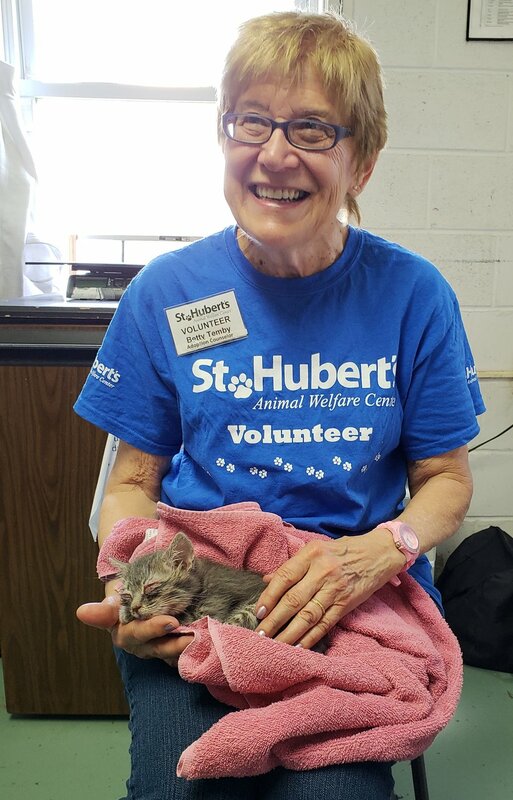 Bill Woolley has lived with at least one cat for every one of his 65 years, so when he retired and was looking for a meaningful way to spend his time, St. Hubert’s seemed like a natural fit. It’s been just over a year since he started volunteering as a feline friend at Noah’s Ark, and Bill has become indispensable, devoted to the cats and a favorite of the staff. Bill is modest about his talents as a cat whisperer. “Cats and I just seem to have personalities that mesh well and I’ve never met a cat who didn’t capture my heart.” He is an effective advocate as well. 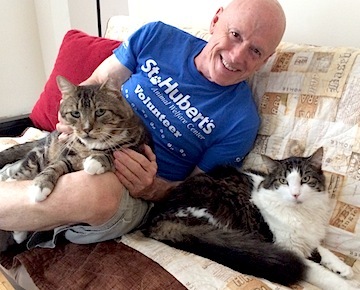 With help from St. Hubert’s staff he started a TNR project in his neighborhood last year. So far he has accommodated 11 cats in his apartment before returning them to the outside or socializing them well enough to surrender to Noah’s for adoption. Because of his efforts, four cats have found great homes, and Bill has quietly sponsored the adoption fee for each one. Patty Millin works full-time, but her Sundays are devoted to St. Hubert’s. She arrives by 8:30 am and spends the entire morning- often longer- cleaning the dogs’ kennels. Warm, kind and always smiling, Patty is committed to keeping the dogs at the shelter happy and comfortable. A dedicated volunteer for the past 12 years, she is a favorite of staff and a welcoming mentor for new volunteers just starting out. 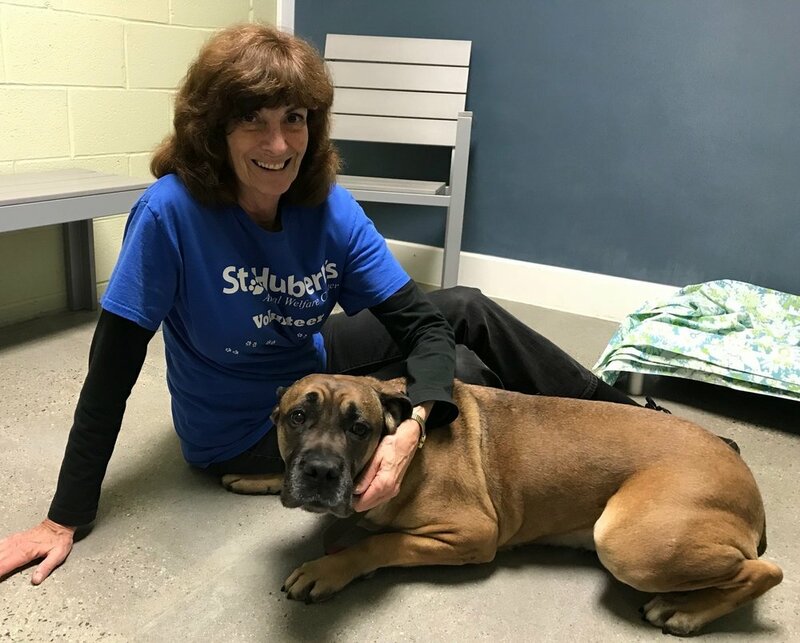 Born and raised in Madison, NJ, Patty grew up reading St. Hubert’s newsletters, and she adopted her Sharpei mix Bruce in 2006. Several months after bringing Bruce home she decided to try volunteering. “It became a way of life,” she says. Initially she worked with dogs, cats and small animals, but soon found that her heart was with the dogs. But Sam’s volunteer activities at St. Hubert’s don’t even end there. She is an assistant trainer in the Training and Behavior School, works with the newly formed Youth Task Force, has been part of the evaluation “crowd” at pet therapy examinations, and helps out at adoption events. When she is not volunteering, Sam works as a vet assistant at an animal behavior clinic and is taking pre-vet classes as well. St. Hubert’s is extremely fortunate to have her! Newly retired back in 2013, Bev Barney decided to volunteer at St. Hubert’s after bringing her Cavalier King Charles Spaniel, KC, to a therapy dog prep class at the Training and Behavior Center. But her early volunteer experience did not go entirely smoothly. On her first day of dog walking training, Bev remembers, “I couldn’t get the harness on, and the dog escaped… I flunked.” The dog was quickly retrieved, but a St. Hubert’s staff member gently suggested that Bev might be happier helping out at the front desk. The front desk position suited her perfectly, and she still has regular shifts there, but Bev’s luck with the shelter pups also improved. A warm and compassionate dog lover, she enjoyed making enrichment toys and took videos for the ASPCA Behavioral Rehabilitation Center, when it was still based at St. Hubert’s. Then she was asked by a St. Hubert’s staff member if she’d be interested in spending some quiet time with a few of the most frightened dogs in the kennel. This quickly became one of Bev’s favorite activities, and twice a week she spends an hour in a quiet room reading to dogs. “I read a book I think they will enjoy,” she says. The One and Only Ivan and All Creatures Great and Small are her current go-to selections. Shy Canela, pictured below with Bev, visibly brightens when she comes to her kennel. Bev and her therapy dog KC, now 12 years old, also still make regular visits to Morristown Medical Center. And Bev enjoys making follow-up calls to people who have adopted from St. Hubert’s. “Ninety five percent of them are happy,” she says. The ones who are having trouble she connects with the Pet Helpline. Bev’s commute to the Madison campus can take more than an hour. Both the animals and staff are grateful she’s committed to making the drive! For almost nine years, with little fanfare, volunteer Roy Morance has devoted one Sunday every month to St. Hubert’s. Rain or shine (“March was bad,” he says with some understatement,) Roy and his friends Kathy and Eleanor set up a table in front of the Hackettstown or Ledgewood Walmart. They hand out wish lists, collect cash and donations, and talk to people about the animals at St. Hubert’s. In May their drive raised more than $700 in cash and supplies. 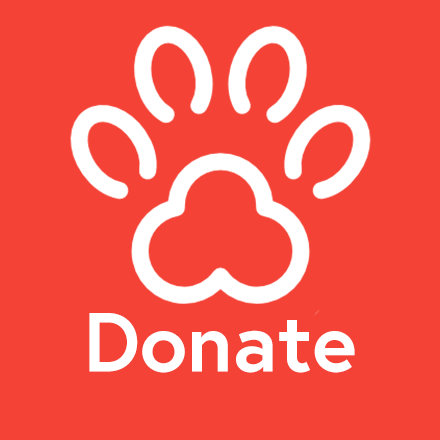 Soliciting donations doesn’t come naturally to Roy, who is on the shy side, but his passion outweighs his reticence “We do it for the animals,” he says. After a 38 year career as a CPA and controller of a publishing company, Roy retired in 2016. The self-described workaholic stayed home for precisely one day, before launching into multiple volunteer activities that include ESL tutoring, two food banks, a dog rescue and Habitat for Humanity’s ReStore. With a schedule like this, St. Hubert’s is very lucky to have him one day a month! Mark Swotinsky enjoys his role as greeter in the front lobby, but he finds the gritty work of cleaning kennels even more satisfying. Mark and his wife, Arlene, like to be involved in activities that directly impact the dogs, and a clean, sparkling kennel is its own reward. One of Arlene’s favorite spots is the laundry room; she knows that washing and drying towels and blankets ensures that each animal will always have the comfort of a clean, soft bed while they wait to be adopted. They both like knowing that the time they spend on these vital tasks frees up staff to spend more time with the animals. Mark retired in 2016 and St. Hubert’s was lucky to get him in November that year. Arlene got involved a few months later and this warm, low-key couple have been dedicated volunteers ever since. Their volunteer activities definitely don’t end with cleaning and laundry. Mark is an avid dog walker, and both he and Arlene love to interact with people as well. They have taken dogs to adoption events (and were gratified when the pups were quickly adopted). They also help at offsite fundraising events: Santa Paws, Dine with a Dog and the 5K race are among their favorites. And they enjoy being part of of the “crowd” at Paws for People therapy dog evaluations. One of their favorite, most exhausting, and most rewarding volunteer roles is as dog fosterers. First up was a momma and six adorable, wiggly puppies they brought home a few weeks before Christmas last year. Keeping up with- and outsmarting- the puppies kept them on their toes, and they fell in love with the pups’ patient and placid mom, Belinda. The puppies were all adopted immediately after Mark and Arlene brought them back just before Christmas. They were ready to bring Belinda back home with them so she wouldn’t have to spend the holidays at the shelter, but she quickly found a home as well. They provided critical enrichment to their next foster, Jenny; she too was quickly adopted after being in their care. 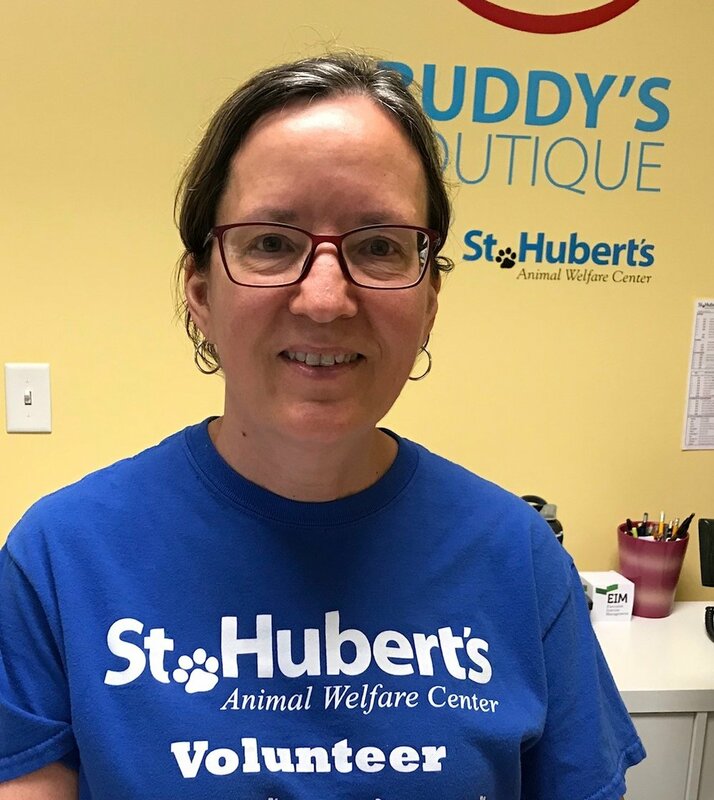 St. Hubert’s Foster Coordinator Kat is confident that when the Swotinskys take on a foster dog, that dog will be in devoted, loving hands. Mark and Arlene love St. Hubert’s and the people they’ve met here. And the feeling is definitely mutual.